Media and Contents: Soft cover A5 sized with 48 pages of text, 55 black and white photos, 3 colour photos and 9 colour art-works. I must admit, my main interest in Submarines is in Royal Navy WW II. However, as there is almost nothing written on that subject, the German U-Boat Arm comes a very close second. On this subject there is heaps, so much in fact that you might ask, “Do we need any more?” The answer is yes, we need more of U-Boot Im Focus. 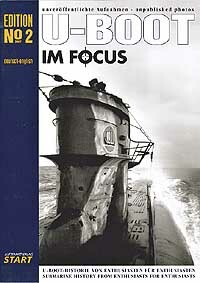 U-Boot Im Focus is different. It doesn’t write about Otto Kretschmer and his U-99 or Gunther Prien (U-47) and the other Aces but shows little known photos of more ordinary boats, crews, emblems and colour schemes that would other-wise be lost. Most of the articles come under headings such as Type I boats, Type VII A boats, Electoboats, Conning towers, Colour photos, Unknown emblems etc. A good example of the quirkiness of this book comes under the heading of Reader's forum, an outside toilet on a U-boat. Now that's not something you would expect in this kind of book, but there it is, and it has an “in action” photo to back it up. Similarly, under the heading of Unusual, the use of sun-lamps in U-boats because the crew were not getting enough exposure to sun-light in daily life, something that is very important to good health. And then there was Kptlt. Jurgen Konenkamp in U-375. He thought he had torpedoed and sank a British County Class Cruiser (he called it a London Class) on the 1st of December 1942 in the Mediterranean. Unfortunately, U-375 was sunk along with its captain and crew before the truth came out. There are several colour artworks presented, most of them are conning towers showing emblems and colour schemes and one side profile of a Type II B, U-18 as it appeared during operations in the Black Sea. With nineteen separate articles, some just a photo and lengthy caption while others are much longer, this book can be read from cover to cover with everything being of interest. As you will no doubt have guessed, I am really looking forward to what comes next. Highly Recommended to the Extreme.